I want to help optimize people’s overall well-being! When he was a young boy, Dr. John was diagnosed with scoliosis (abnormal curves in the spine) during a health screening. His pediatrician referred him to a chiropractor who adjusted him. As a result, Dr. John’s spine was returned to its normal position. When he was in high school, he also suffered from alopecia areata, an autoimmune disease that would cause clumps of his hair to fall out. After years of experimental medical treatment for the condition, which was given with no consistent results, Dr. John started seeing a family chiropractor again. He also received nutritional counseling. The results were incredible. After these experiences, Dr. John became interested in chiropractic care and the idea that, the body doesn’t make mistakes and when given the proper tools, the body can heal itself. Dr. Vincent graduated from Central Arkansas Christian in 1998. After finishing his undergraduate prerequisites in Arkansas, he moved to Atlanta to attend Life University. He graduated in 2004 with his Doctor of Chiropractic. Then, he practiced in Atlanta for three years before returning to Arkansas to practice in West Little Rock. 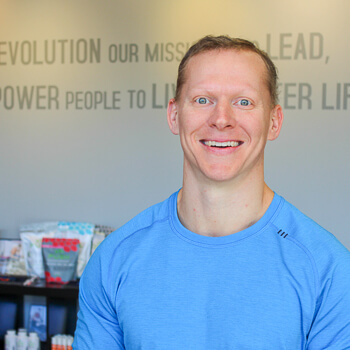 To further his education, Dr. John earned a postgraduate certification as a Certified Chiropractic Extremity Practitioner (CCEP), and a Certified Chiropractic Wellness Practitioner (CCWP). He also completed a certification program in pediatrics and pregnancy through the International Chiropractic Pediatric Association (ICPA) in 2011. The certification allows him to help mothers through their pregnancy and children as their spine is developing. Dr. John is also certified in Webster Technique and is an Epic chiropractor. In 2013, he also completed certification in sports taping to improve performance and prevent injuries for the athletes in our community. When he’s not at the practice, Dr. John enjoys spending time with his wife Jessica and their four children, all of whom receive regular adjustments. If you’d like to feel your best, contact Wellness Revolution today to book a same-day appointment with Dr. John!